Our uPVC Doors are available in a variety of styles and configurations and in a range of colours. They can open in or open out and can be combined with a choice of sidelights. High security multi-point hook locking is standard as are high security, fully adjustable flag hinges. 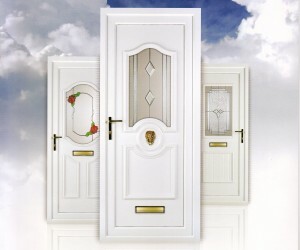 uPVC doors at Meir Glass Centre come with a choice of door furniture – white, gold, chrome or black. A major advantage of UPVC doors is that they are much stronger than traditional wooden doors due to the way in which they are constructed. A major problem with wooden doors in a largely damp climate such as the UK is that of warping. When wood is exposed to damp conditions for long periods it can swell and warp, this is a major disadvantage for doors that you really want to open and close with ease. UPVC doors are rigid and they are weatherproof and dam proof, which means they are not susceptible to the conditions that cause wooden doors to warp. Because UPVC doors maintain their original shape despite the weather conditions, it is rare for them not to fit snugly in their frame and be easy to open and close no matter what the weather is doing. UPVC doors, like UPVC windows, require very little maintenance. You may need to oil the locking mechanisms from time to time as all locks can become stiff over time. All that is really needed in the way of maintenance is light cleaning of any glazed areas and an occasional wipe down of all other areas as needed. UPVC is an exceedingly durable material, which is one of the reasons for its popularity in the making of windows and doors. We are so confident of the strength and durability of the material that we offer a ten year guarantee on our installations.